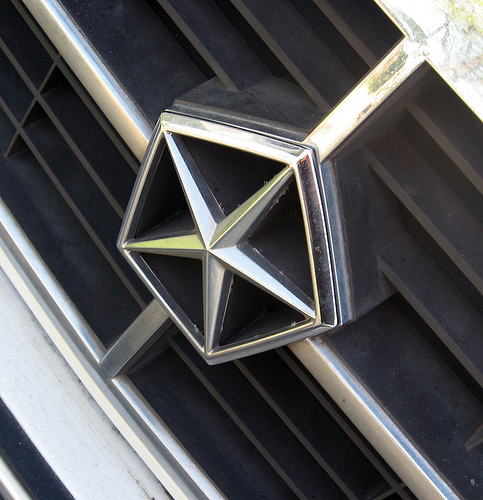 How did Chrysler end up in such sorry position? Lynn Townsend, Chrysler president from 1962 to 1966 and chairman from 1966 through 1975, had steered a conservative course, eschewing innovation in engineering, styling, or product planning in the name of fiscal restraint. Unfortunately, that strategy left Chrysler ill equipped to compete in a changing marketplace. As the popularity of imported small cars skyrocketed, Townsend resisted the industry push to subcompact cars, relying instead on badge-engineered Hillman and Mitsubishi models that were no match for Volkswagen, Toyota, or Datsun. Chrysler retreated from the lucrative pony car market after ten years of indifferent results and it had failed to even enter the booming personal-luxury segment. Chrysler’s only really successful new product of the early 1970s was the Plymouth Duster, which, as we have seen, was developed largely off of the corporation’s radar. These failings might have been less problematic if the corporation’s bread-and-butter big cars had sold well, but their sales had been slipping since 1969 and the OPEC oil embargo of 1973-74 put them into a tailspin. The only bright spot in Chrysler’s portfolio was the aging A-body compact line (the Dodge Dart and Plymouth Valiant/Duster), which, after years of corporate neglect, unexpectedly became Chrysler’s saving grace. 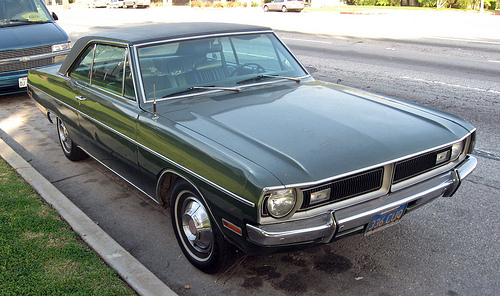 The Dodge Dart and Plymouth Valiant were among the few really successful Chrysler products of the mid-seventies. This is a 1971 Dart hardtop, powered by the 225 cu. in. (3,696 cc) Slant Six. Confronted with falling sales and spiraling inflation, Townsend decided to slash costs, raise prices, and institute a number of desperate measures. All proved short-sighted. The price hikes hurt sales even more, and earned Chrysler public derision from the White House. The cost cutting led to a nearly 40% reduction in Chrysler’s capital investments — which meant fewer new products and no new equipment. To avoid having to idle its factories, Chrysler created a “sales bank,” building cars that no one had ordered and simply stockpiling them until dealers could be browbeaten into accepting them. To clear the stockpile, the corporation began the then-novel practice of offering cash rebates: paying customers to buy their cars. Despite all these efforts, the company’s cash flow remained poor and the unpaid bills began to mount. Townsend retired in 1975, replaced by John J. Riccardo. Like a lot of Chrysler executives of the time, Riccardo soon found himself in over his head. Townsend had believed that a competent executive could go a good job in any area, regardless of experience. As a result, many of Chrysler’s 30-odd vice presidents were in jobs for which they were ill-suited. Despite Townsend’s own accounting background, his tenure had led to a near-total breakdown of Chrysler’s financial controls and internal communications, to the point that its leadership had little clear idea of how much trouble they were actually in. Still, Riccardo and new president Gene Cafiero took steps in the right direction. Cafiero ordered the development of Chrysler’s much-belated first small car, an American version of the European Horizon, which debuted to great acclaim in late 1977. Chrysler finally entered the personal-luxury market with the intermediate Cordoba, which soon accounted for around 60% of all Chrysler-badged cars. They also got a non-automotive windfall in 1976, when Secretary of Defense Donald Rumsfeld awarded Chrysler Defense the contract for the Army’s new XM1 main battle tank (which emerged as the M1A1 Abrams) despite strong objections from the Army. In 1978, Riccardo announced that Chrysler would invest billions in new products and new factories, modernizing its entire lineup in the early 1980s. The Plymouth Volare briefly held the sad title of most-recalled car in America, and it never sold as well as its Valiant predecessor. 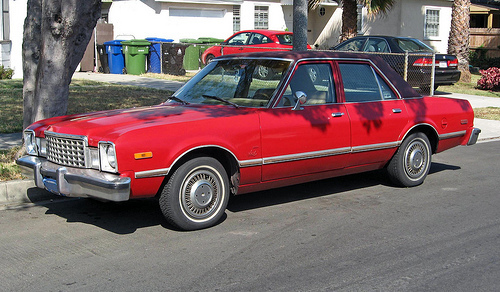 This is a 1978 Plymouth Volare four-door sedan. Despite these moves and the general recovery of the auto industry in the latter half of the seventies, Chrysler remained on very shaky ground. 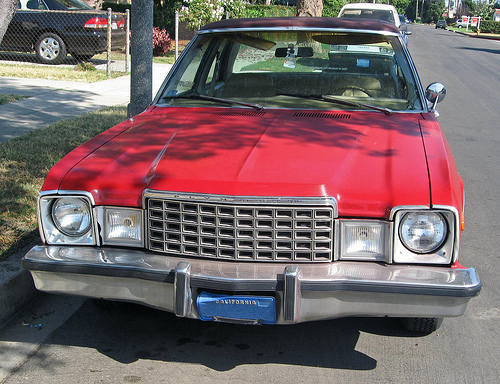 The corporation’s F-body compacts (the Dodge Aspen and Plymouth Volare), introduced for 1976 to replace the A-bodies, were the subject of an expensive and embarrassing recall campaign that further tarnished Chrysler’s reputation for quality control. Long-term debts mounted, reaching almost $1 billion by 1979, and financial institutions became increasingly wary of lending to Chrysler. The corporation was forced to sell a number of assets to remain solvent, including its entire European division. Whatever John Riccardo’s failings as chairman, he was willing to acknowledge when he needed help. In 1978, he demoted Gene Cafiero to the largely symbolic post of vice chairman and hired Lee Iacocca as Chrysler’s new president and chief operating officer. As we have previously seen, Lee Iacocca was a senior executive at the Ford Motor Company, a former engineer who made a name for himself in sales before ascending to general manager of Ford Division in late 1960. He had won considerable acclaim for the hugely successful Ford Mustang and a series of astutely timed new products like the Lincoln Continental Mark III, Mercury Cougar, and Ford Maverick. In December 1970, Henry Ford II named Iacocca president of Ford Motor Company. Iacocca kept Ford profitable during the trying times of the mid-seventies, despite limited resources and the challenge of new federal regulations. 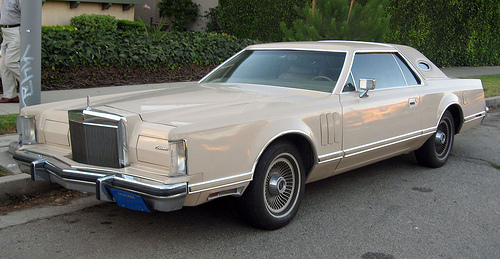 The Lincoln Continental Mark V was the most popular of the Mark series, another of Iacocca’s successful product concepts. It accounted for more than 225,000 very profitable sales between 1977 and 1979. The more Iacocca’s reputation grew, however, the more antagonistic his relationship with Henry Ford II became. Although Ford was a public company at least in name, it remained very much a hereditary dynasty and its aging monarch was deeply suspicious of ambitious, charismatic outsiders like Iacocca. Henry’s trust in Iacocca gradually eroded, particularly after Iacocca attempted to strike a deal with Honda to provide engines and transmissions for Ford’s new subcompact Fiesta, something Henry considered unthinkable. According to author David Halberstam, by 1976, Iacocca and Ford no longer spoke directly, relying on intermediaries to carry messages back and forth. In 1977, Henry effectively demoted Iacocca by appointing Phil Caldwell to a newly created position as deputy chief executive, apparently hoping the move would drive Iacocca to quit. When Iacocca did not budge, Ford compounded the humiliation by naming his own younger brother, William Clay Ford, as the company’s new chief executive. Iacocca had borne the initial demotion reluctantly, but the latest step was too much. According to Halberstam, in June 1978, Iacocca went over Henry’s head to Ford’s board of directors, telling them that the company needed leadership that only he could provide. Furious, Henry fired Iacocca days later. Despite Iacocca’s friends on the board, no one at Ford was willing to seriously challenge the grandson of the founder. That Lee Iacocca came to Chrysler after his dismissal was largely at the behest of his old friend Hal Sperlich. Sperlich had been a product planner at Ford, one of Iacocca’s protégés and leading allies, but he had been fired in 1976 after clashing too many times with Henry Ford II. Sperlich joined Chrysler in early 1977 and played an influential role in convincing Iacocca to follow him. Riccardo approached Iacocca in August 1978 and that November, Iacocca accepted the position of president and chief operating officer. Iacocca wrote later that he was immediately stunned by the disastrous condition of Chrysler’s management and finances. He recognized that Chrysler had made a series of bad business and product decisions, but he had underestimated the systemic nature of its malaise. Hal Sperlich responded ruefully that if Iacocca had understood how bad things had become, he never would have accepted Chrysler’s offer. Popular mythology has credited Lee Iacocca with many things during his time at Chrysler, including the introduction of the popular front-wheel-drive K-cars and the federal bailout that made them possible. The truth is that the K-cars were already in development by the time Hal Sperlich arrived in 1977 and the difficult decision to build them was made not by Iacocca, but by John Riccardo. The same was true of the federal bailout, which was conceived by Riccardo; the idea of it made Iacocca very uncomfortable. The Plymouth Volare had a much shorter life than the Valiant; it was dropped after 1980. Curiously, in its first three years, the wagons were consistently more popular than the sedans, outselling their four-door counterparts by almost two to one. Perhaps Iacocca’s greatest real contributions to Chrysler were his salesmanship and his reputation. Within a few months of becoming president, he had convinced a host of Ford executives (many of them retired) to join him. Just being able to entice talented people to join Chrysler at that time was no small feat. Chrysler’s reputation had been sinking for years and by early 1979, as its financial losses grew, the stench of death was heavy in the air — not something that generally entices talented employees. By the summer of 1979, Iacocca had razed Chrysler’s corporate culture, written off a number of the more disastrous management decisions, and instituted new financial controls to give him a more realistic understanding of the company’s position. That understanding was a grim one: Chrysler’s losses for 1979 totaled $1.1 billion, and its market share had dropped from 11.3% to 10.1%. The sales bank, meanwhile, had a stockpile of 110,000 unsold cars, many of which had languished so long that they required hundreds of dollars of work to make them salable. Chrysler pursued a variety of rescue scenarios, including a mooted financing deal with notorious Saudi arms dealer Adnan Khashoggi and a proposed merger with Volkswagen, but these potential saviors withdrew once they learned the extent of Chrysler’s financial predicament. Riccardo finally decided that they had to seek federal aid. Iacocca may have been deeply reluctant about asking for government assistance, but as Chrysler’s appointed cheerleader and chief salesman, he threw himself into the task with zeal. He testified before Congress that Chrysler’s collapse — which was by then a matter of when, not if — would be disastrous for the U.S. economy. Iacocca insisted that the company could be saved and presented a five-year plan to restore it to fiscal health. John Riccardo had originally intended to remain as chairman until at least 1980, but the mood in Washington and on Wall Street demanded a scapegoat and he decided to throw himself on his sword. With Riccardo’s resignation, Iacocca became chairman, finally achieving the position he had been denied at Ford. By then, Chrysler was functionally bankrupt, surviving mostly by forcing its suppliers to accept IOUs instead of cash. Massive layoffs were instituted among the white-collar staff. Meanwhile, Iacocca negotiated a deal with Doug Fraser of the United Auto Workers (UAW) for $462.5 million in short-term wage concessions, in exchange for which Fraser earned a seat on the Chrysler board. As a symbolic gesture, Iacocca instituted the Salary Reduction Program, making modest cuts in executive salaries (2–10%) for a two-year period. He made a great show of reducing his own salary to $1 a year, although with his director’s fee, signing bonus, and other incentives, his actual cash compensation was still around $360,000. Late in December 1979, Congress passed the Chrysler Corporation Loan Guarantee Act. It would give Chrysler $1.2 billion in federally guaranteed loans with a modest guarantee fee of 1% per annum. However, to get those loans, the corporation had to issue $50 million in new stock, sell off $300 million worth of additional assets to improve its cash position, and obtain $2 billion of concessions from workers, banks, local governments, dealers, and suppliers. It also had to accept significant federal oversight through the creation of a second board of directors, consisting of the U.S. comptroller general, the secretaries of Labor, Transportation, and Treasury, and the chairman of the Federal Reserve. Fearing that they were losing traction and hoping to sweeten the pot, Iacocca threw in a stack of call warrants, entitling the Treasury Department to purchase 14.4 million shares of Chrysler stock for a fixed price of $13 per share. President Carter signed the bill into law in January 1980. These were not the only concessions Chrysler received. The Department of Transportation reduced Chrysler’s CAFE target for trucks by 0.8 mpg, while the EPA granted a temporary relaxation of the carbon monoxide emissions standards for the 1981 model year. More significantly, the U.S. began negotiating for trade restrictions on Japanese imports, which culminated in the 1981 Voluntary Automobile Import Agreement signed with Japan, intended to stem the growth of Japanese cars in the American market. It took Chrysler about six months to meet the conditions of the initial $500 million in federal loans. They were not enough to offset the company’s horrifying losses, which totaled $1.7 billion, despite an additional round of layoffs and cost cutting. Iacocca tried to convince Treasury to give Chrysler quick access to the remaining $700 million in loans, fearing that incoming President Ronald Reagan would kibosh the deal. Treasury agreed only to a $400 million disbursement, and to get it, Chrysler had to negotiate an additional $1 billion in concessions from its suppliers, workers, and creditors. Most significantly, the banks allowed Chrysler to convert $560 million of its long-term debt into preferred stock and discounted the more than $700 million of the remainder by a whopping 70%. Despite the launch of the new K-cars in December 1980, the cash burn continued through the end of 1981, leading Iacocca to sell off Chrysler’s last remaining salable asset: Chrysler Defense, the corporation’s tank division. The sale to General Dynamics netted $340 million in early 1982, which was enough to offset Chrysler’s $69 million operating losses for that year. Still, Chrysler’s immediate future depended on its new car line, introduced in late 1980 as 1981 models. Next week, we’ll look at those — including the one you probably haven’t heard of. Then, in Part Two of this article, we’ll examine the outcome of Chrysler’s federal bailout. Is actually a 197[i][b]8[/b][/i] Volare; I can tell by the grille. What projects did Chrysler have in the works which would have potentially butterflied away the company’s malaise and financial problems and what other steps could it have taken? Since Chrysler’s problems also negatively impacted its UK/Europe subdivisions (including projects that could have saved Chrysler Europe) as well as further exasperated the latter’s own problems. I don’t think there’s an easy “if they had only …” story here. The company’s U.S. product development had suffered badly for years, due in part to Lynn Townsend’s tight grip on the corporate purse-strings and in part because past missteps had left Chrysler in a very reactive mode. It wasn’t any one mistake; there had been a whole series of missteps and miscalculations (many of them coming down to bad timing as much as anything else) that had cost them a lot of ground in a bunch of different market segments, including a lot of the more profitable segments. There wasn’t one magic wand they could have waved in 1975 that would have changed everything. Aware there was no one mistake that caused Chrysler’s problems in the US, though surely there must of been more competent or perceptive people available to run Chrysler then Lynn Townsend as well as projects that could have amounted to something were they not nipped in the bud? In the case of Chrysler Europe, it would have been better for Chrysler to have limited its European acquisitions to just Simca as in real-life it was the profitable part of Chrysler Europe, instead of also acquiring the Rootes Group and having to deal with the latter’s problems as well as trying to integrate the two companies during Chrysler’s malaise. Also worth mentioning that Carrozzeria Fissore managed to transform the Dodge Aspen into the more appealing Monteverdi Sierra, not sure whether acquiring Fissore would have been the golden ticket for Chrysler in the US as it would in Europe though it would have certainly helped. Well, Townsend had been installed originally to put Chrysler’s financial house in order after the various scandals and mishaps of the late ’50s and early ’60s, which had left the shareholders up in arms. I don’t think his competency was an issue so much as his priorities. He was a fairly conservative finance man by training, and I think he had the support of the board for a long time because he could return decent numbers and keep a rein on overhead costs. The problem was that they ended up in, as I said, a very reactive mode as far as the market was concerned. The main product planning hits they had in the late Townsend era were often either lucky (the Duster, which was a more or less sub rosa project) and/or accomplished over general corporate resistance (like the Road Runner, which was a very astute piece of merchandising that many senior Chrysler people found dismaying). They also bet heavily on the wrong horse repeatedly: the “Fuselage” C-bodies, the E-body cars, and then the 1971 B-body intermediates, which all cost a bundle of money to develop and then really under-performed commercially. The Rootes Group acquisition was well before Chrysler’s serious malaise really became apparent — it started early in Townsend’s tenure and I think Chrysler had full ownership by 1967, although it was a few years later before they changed the name. I haven’t studied the history of the Rootes Group in any great detail yet (there was a splendid history over on Curbside Classic a few months ago that I’d highly recommend, though), but Chrysler’s rationale was reasonable enough. I think they were likely motivated by the creation of Ford of Europe; since Ford was about to start consolidating its models and thus (at least in theory) bringing down its costs, Chrysler probably felt they needed to jump if they were going to have a chance at getting into that market. I don’t think the Fissore approach would have done much for the Aspen. The principal issues with the Aspen and Volare were not so much their styling or performance, but their quality control and reliability. People hadn’t been buying Valiants and Darts because they were terribly exciting cars, but because they were cheap and reasonably dependable; had the Aspen and Volare been more of the same, it would have helped a lot more. Making them better looking wouldn’t have hurt, of course, but not losing existing Dart/Valiant buyers to fears of quality control issues would have been a good start. The fourth-generation pony cars Chrysler decided not to build might have been helpful to some extent had they made production. They wouldn’t have reversed Chrysler’s fortunes — Chrysler needed a stronger position in the bread-and-butter categories for that — but considering the success of the late ’70s Camaro and Firebird, they might at least have provided something more profitable and a bit more exciting, both qualities Chrysler could have used more of in that era. Beyond that, I don’t think there were a lot of unbuilt gems; that was part of the problem. Have read that one of the Rootes Group’s problems prior to the Chrysler takeover was that it was affected by Singer’s debts when it acquired the latter, along with being forced by the government to build the Imp 300+ miles away at Linwood (instead of in Coventry) in return for a loan (negatively impacting the Imp with an untrained workforce and killing off the Swallow project). In the Rootes Group’s favor was the unrealised potential of the Imp and Swallow projects (plus related spinoffs including sports cars and micro-bus variants, etc) or at least their Coventry Climax based OHC engines (which were superior to Simca’s engines), the former originally ranging from 800-998cc (the 800cc was not produced along with an unrealised taller-block version with up to 1150cc) and the latter 1250-1750cc respectively. In the same period Simca developed a transverse-engined fwd Mini-rivaling city car project during the 1960s below the Simca 1100 called the Simca 936 (loosely resembling the later Renault 5), which was intended to replace the rear-engined Simca 1000 only for the 936 to be cancelled by Chrysler since it competed with the rear-engined Imp. At least with Ford and GM’s UK and European divisions they had some commonality with each other beforehand prior to being integrated, which was not the case with Simca and Rootes now renamed Chrysler Europe and Chrysler UK resulting in the lamentable Chrysler 180 (doing without the Bertone styling, V6 engine, 5-speed gearbox, etc). Of the two Simca was more profitable and their smaller cars projects (both the 936 and the later C2-short) were more in tune with the demands of the European market compared with Rootes in spite of Simca’s inferior engines.